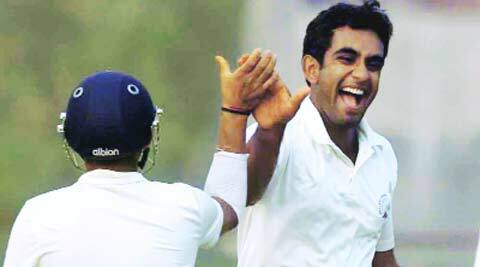 Jayant Yadav says he wasn't very optimistic about his chances. Jayant Yadav took 17 wickets this Ranji season. Even though his name was on the IPL 7 auction list last week, Jayant Yadav wasn’t anywhere around a TV set when the bids were called for. While Yadav’s father was glued to the television, Yadav was playing a practice game at the Palam ground. Yadav says he wasn’t very optimistic about his chances. He had been a lot more confident ahead of the IPL last season. While he is predominantly a bowling all rounder, in the2012/13 season, he had just written his name in the record books after putting on a eighth-wicket stand of 392 runs with Amit Mishra in a Ranji Trophy game. “That knock was something that got me a lot of attention so I was a bit disappointed that no team signed me last year. But I thought to myself that it would be better that I improved as a player so that when I got my chance, I would be able to perform,” recollects Yadav, 24. At the auction this year, things appeared to be going on similar lines as no team bid for him initially. “This time around after I wasn’t picked in the first round of the auction, I wasn’t too upset. My father was more disappointed because he had not gone to work but chose to follow the auction,” he says. It was only after his game that Yadav was told that he had been bought by Delhi Daredevils for his base price of Rs 10 lakh. “It is a huge opportunity and moment for me,” says Yadav. The IPL contract caps off a strong year for Yadav. This Ranji season – Yadav’s third – saw him get a lot more playing time with legspinner Amit Mishra playing only three matches. “This season was important from a learning perspective as I had to take on a lot more responsibility,” says Yadav who terms Haryana’s game against Vidarbha at Nagpur as a crucial one. “The pitch was quite flat and there was no help for the pacers. Amit Mishra wasn’t playing so me and another young bowler, Yuzvendra Chahal, were the main spinners. There could have been a lot of pressure on us but we were able to keep the pressure on Vidarbha and restrict them. We lost the match but it was a big learning experience,” says Yadav who took a five wicket haul in the match and a season total of 17. Yadav admits getting a chance at the Delhi Daredevils might be hard this season considering the side already have a couple of senior spinners. in Rahul Sharma and Shahbaz Nadeem. “But since the other two are different spinners (Sharma is a legspinner while Nadeem bowls left arm orthodox) I hope to get some playing time and contribute,” he says optimistically. Yadav says he is looking to make the most of his stint with the Delhi Daredevils. “To have the ability to be able to pick the brains of Gary Kirsten will be a great opportunity. As a player any chance to get knowledge from a top international player and a World Cup winning coach will be a great learning experience,” he says.